Bucks County is com­prised of 13 school dis­tricts, sup­port­ing more than 96,000 stu­dents in over 270 schools. With over 9,000 edu­ca­tors, these school dis­tricts all work dili­gent­ly to pro­vide excep­tion­al edu­ca­tion­al oppor­tu­ni­ties to the chil­dren they serve. Click on each dis­tricts to learn more about the advance­ments and news hap­pen­ing with their stu­dents and in their schools. Together We Build Strong Minds! 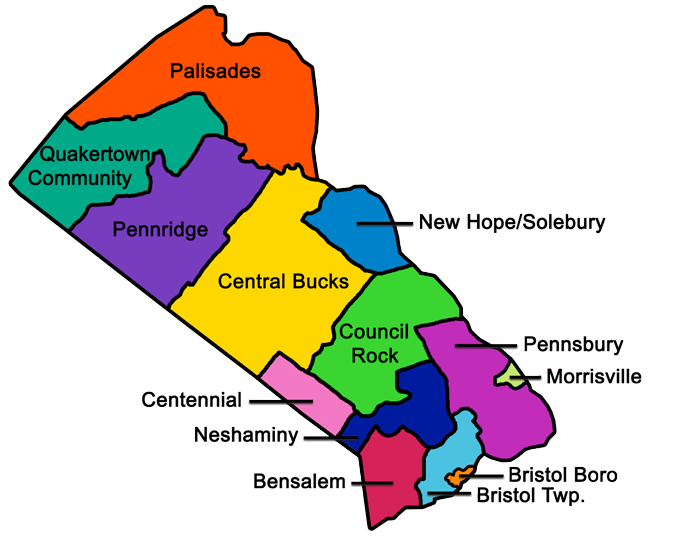 Bensalem Township School District oper­ates six ele­men­tary schools (K‐6), two mid­dle schools (7–8), and one high school (9–12). The District pro­vides a wide array of options and oppor­tu­ni­ties for our stu­dents, and we are proud of our suc­cess­es. Bensalem Proud, Bensalem Strong! Bristol Borough is an his­toric riv­er com­mu­ni­ty locat­ed 22 miles north of Philadelphia. The com­mu­ni­ty has a great deal of pride in the peo­ple who make Bristol a vibrant place to live. The Bristol Borough School District, with a stu­dent pop­u­la­tion of 1250 stu­dents, builds upon this enthu­si­asm with a rich multi‐cultural stu­dent pop­u­la­tion. Bristol Township School District has six schools (3 ele­men­tary, 2 mid­dle and 1 high school) with approx­i­mate­ly 6300 stu­dents. At each grade lev­el, the District has imple­ment­ed a cur­ricu­lum that will help equip stu­dents to be good cit­i­zens, knowl­edge­able employ­ees and effec­tive lead­ers. We sup­port every stu­dent, every day! Centennial School District has 6150 stu­dents in 3 new ele­men­tary schools, 2 new­ly ren­o­vat­ed mid­dle schools and 1 new high school. The dis­trict cov­ers Warminster Township, Upper Southampton Township and Ivyland Borough. Our goal is to inspire our stu­dents with an empha­sis on 21st cen­tu­ry skills, glob­al aware­ness and inno­v­a­tive prac­tices. Central Bucks is the third largest school dis­trict in Pennsylvania, with approx­i­mate­ly 18,400 stu­dents in 15 ele­men­tary schools, 5 mid­dle schools and 3 high schools. The dis­trict includes the bor­oughs of Chalfont, Doylestown, and New Britain and town­ships of Buckingham, Doylestown, New Britain, Plumstead, Warrington, and Warwick. Council Rock School District dis­plays with­in its bound­aries an intrigu­ing blend of his­to­ry and progress. Serving over 11,000 stu­dents, the dis­trict oper­ates 10 ele­men­tary schools (grades K‐6), 2 mid­dle schools (grades 7–8), and 2 high schools (grades 9–12). Council Rock is also a par­tic­i­pat­ing dis­trict in the Middle Bucks Institute of Technology. Our District is focused on expand­ing the hori­zons and indi­vid­u­al­iz­ing excel­lence for each and every stu­dent. We have 1 ele­men­tary school (K‐2), inter­me­di­ate school (3–5), and middle/high school (6–12) all pro­vid­ing a dynam­ic and car­ing envi­ron­ment achieved by our staff, stu­dents, par­ents, and com­mu­ni­ty work­ing togeth­er towards our mis­sion. Neshaminy School District cur­rent­ly oper­ates 6 ele­men­tary schools, 3 mid­dle schools and 1 high school in a K‐4, 5–8 and 9–12 con­fig­u­ra­tion. The District draws strength from a high­ly sup­port­ive com­mu­ni­ty that has a rich his­to­ry of involve­ment with all aspects of edu­ca­tion. We Build Futures! We are ded­i­cat­ed to pro­vid­ing a safe, enrich­ing envi­ron­ment where­in all stu­dents can achieve col­lege and career readi­ness, and demon­strate lead­er­ship skills. Our rur­al dis­trict cov­ers the town­ships of Bridgeton, Durham, Nockamixon, Springfield, Tinicum, and Riegelsville Borough, and serves almost 1600 stu­dents in grades K‐12, in 5 schools. The Pennridge School District con­sists of 11 schools (7 ele­men­tary schools, 3 mid­dle schools and 1 high school) with a total enroll­ment of approx­i­mate­ly 7,100 for 2018–19. The District encom­pass­es eight munic­i­pal­i­ties (bor­oughs of Dublin, Perkasie, Sellersville and Silverdale, town­ships of Bedminster, East Rockhill, Hilltown and West Rockhill). With near­ly 10,500 stu­dents, the Pennsbury School District has 10 ele­men­tary, 3 mid­dle, and 1 high school. The District draws stu­dents from the town­ships of Falls and Lower Makefield, and bor­oughs of Tullytown and Yardley. We proud­ly pre­pare our stu­dents to become cre­ative, eth­i­cal, and crit­i­cal thinkers for life­long suc­cess in a glob­al soci­ety. Located in Upper Bucks, QCSD sits in a mixed set­ting of sub­ur­ban, rur­al and urban com­mu­ni­ties. The dis­trict pop­u­la­tion of just over 5,000 stu­dents enjoys a diverse cur­ricu­lum that boasts the most Advanced Placement cours­es in PA, pre‐engineering class­es, a state cham­pi­on music pro­gram, World Languages in K‐12 and both pre‐K and full‐day K.